You can remove the customization for either a portal or a particular page in a portal by locating the portal or page in a tree and using the Remove Customization menu option. For example, you can expand a portal to see a list of the pages in that portal. 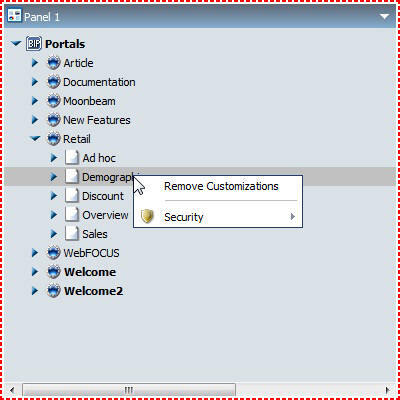 While you cannot open the portal to a particular page, you can remove the customization for just that page with the Remove Customizations menu option, as shown in the following image. Note: You cannot remove customizations at the page or portal level for a portal that you are currently running or editing.